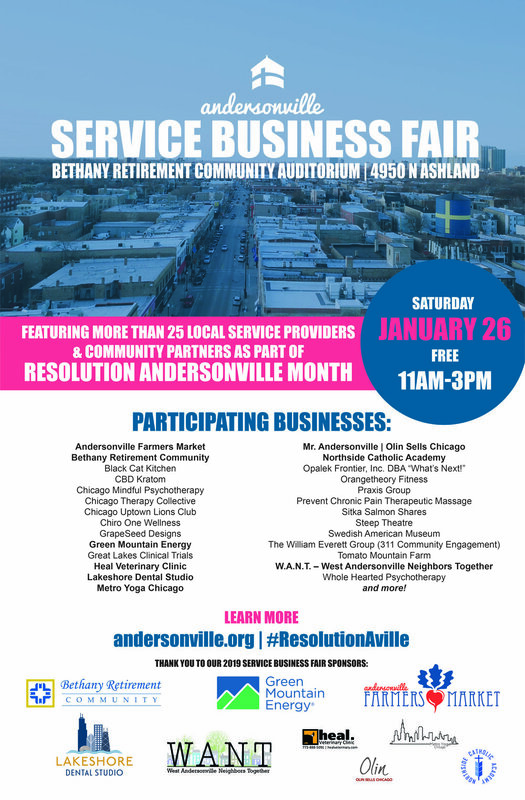 Stop by and visit with us at the annual Service Fair, part of the Andersonville Chamber’s month-long Resolution Andersonville 2019 program! WANT is a sponsor, so stop by and show your support to the neighborhood! This event is FREE to the public — come early for the tote-bag giveaway at the event. The building is just south of Winnemac on the west side of Ashland. The Service Fair will be held in their Auditorium. The space is wheelchair accessible and dogs are permitted. There is FREE parking on Ashland as well as two FREE parking lots. The parking lots are shared by Bethany and Methodist Hospital and are located on the south side of Winnemac just west of Ashland and on Paulina just off Winnemac behind the hospital. You do not need a token or permit to park there.